After twelve productive years, the University of Strathclyde’s relationship with Cetis has now “reached its conclusion”. The Cetis Memorandum of Understanding has been terminated and all Cetis staff at the university have been made redundant. This move comes a year after the closure of the Centre for Academic Practice and Learning Enhancement (CAPLE), the department that had housed Cetis since 2001. One reason given by the university for terminating the relationship is that Cetis are no longer strategically aligned with institutional policy. I first came to the University of Strathclyde as a Research Assistant in 1997 and worked on a wide range of learning technology research projects before winning the contract to run the Cetis Educational Content Special Interest Group (EC SIG) in 2001 along with Charles Duncan at the University of Edinburgh. The following year I was appointed to the post of Cetis Assistant Director and in the ten years that followed Cetis transformed from a Jisc project, to a service-in-transition, to a Jisc Innovation Support Centre and most recently, to an independent technology advisory agency. One constant throughout these changes was the unfailing support Cetis received from CAPLE and all its staff, who provided a stimulating, friendly and supportive environment for all Cetis colleagues who came and went at Strathclyde over the years. Consequently I’d like to thank all those who made CAPLE such a great place to work and who have now moved on to brighter pastures, in particular Professors George Gordon, Ray Land and Allison Littlejohn, all our former academic colleagues and, last but absolutely by no means least, the sterling administrative staff Aileen Wilson, Susan Mitchell, Allison Carmichael and Lynn O’Brien. Many thanks also to Elaine Hurley who has provided invaluable and admirably efficient administrative support over the last six months. Although this week marks the end of Cetis at Strathclyde, Cetis is still very much alive and kicking at the University of Bolton. The centre has broadened its funding base and is going from strength to strength. Cetis will be a launching a new website shortly, so look out for details. I very much hope that I will be able to resume my association with Cetis at some point in the near future but, like Sheila, for the next couple of months I will be taking a sideways step. However I won’t be sitting around twiddling my thumbs, I have conference papers to write with Phil Barker and I will be following up actions from the Open Scotland Summit with colleagues from SQA, Jisc RSC Scotland and the ALT Scotland SIG later in August. There’s also the small matter of a naval history book I’m in the process of writing in my “spare time”. (Have a look here it you’re curious: http://indefatigable1797.wordpress.com). Now here comes the plug…if you happen to need the services of an experienced and approachable learning technologist with a sideline in OER, open education policy and project management, please feel free to get in touch. My new e-mail address is lorna.m.campbell@icloud.com and my twitter and skype IDs remain unchanged. I’ll look forward to continuing working with you all in the future! CAPLE really knew how to make its staff feel valued. 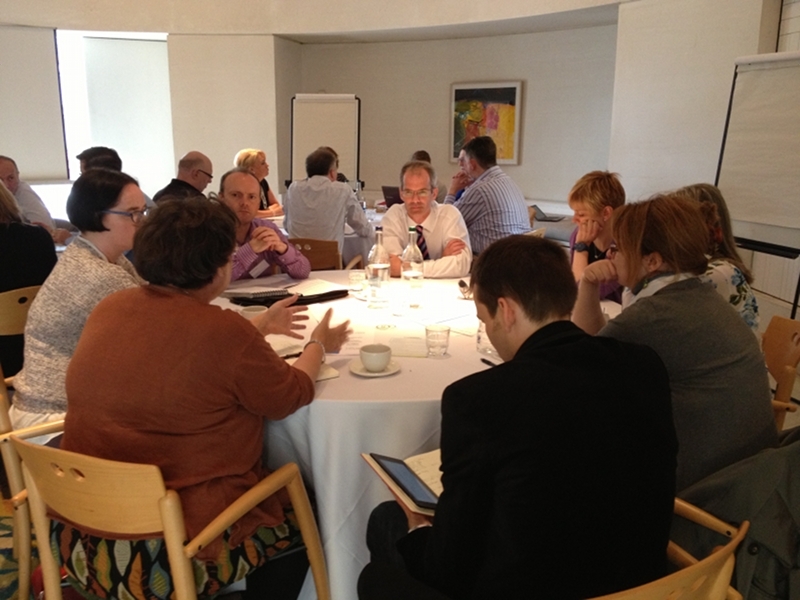 This was the starting point for discussions at the Open Scotland Summit at the National Museum of Scotland in Edinburgh, which brought together senior representatives from a wide range of Scottish education institutions, organisations and agencies to discuss open education policy for Scotland. Facilitated by Jisc Cetis, in collaboration with SQA, Jisc RSC Scotland and the ALT Scotland SIG, Open Scotland provided senior managers, policy makers and key thinkers with an opportunity to explore shared strategic priorities and scope collaborative activities to encourage the development of open education policies and practices to benefit the Scottish education sector as a whole. A series of lightning talks on different aspects of openness and open education initiatives in neighbouring countries followed Cable’s keynote; “Open Source in Education” by Scott Wilson of OSS Watch, “Open Data” by Cetis’ Wilbert Kraan, “MOOCs: The Elephant in the room?” by Sheila MacNeill, also of Cetis, David Kernohan of Jisc presented the HEFCE funded UKOER Programmes, Tore Hoel of Oslo and Akershus University College introduced the Nordic Open Education Alliance, and Paul Richardson presented the perspective from Wales. 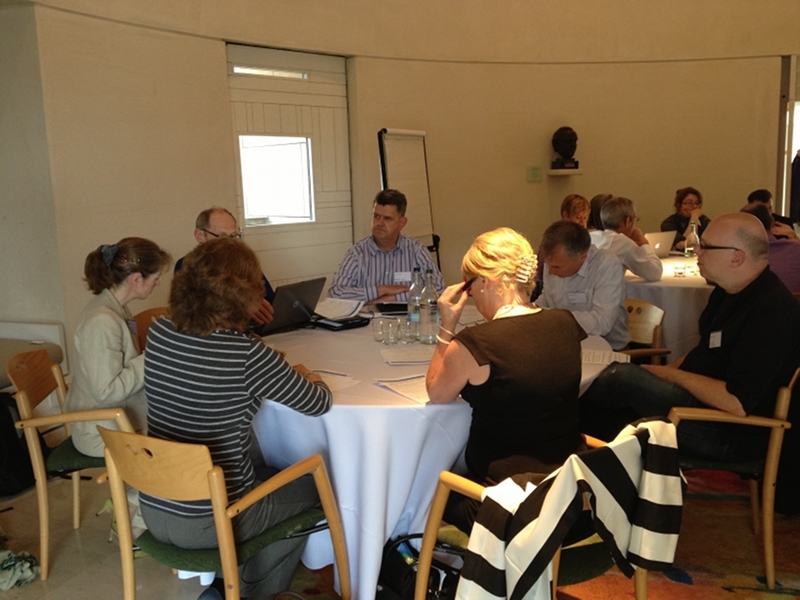 During the afternoon participants had the opportunity to break into groups to discuss issues relating to openness, and how greater openness could help them to address their current strategic priorities and challenges. There are compelling arguments that old models for publishing research and content are outdated. New models are needed and again the arguments for these are compelling, however these new models require changes in attitude and practice. University business models don’t necessarily need to be built on sale of content, instead they can be built on access to great faculty, support, facilities, maximising efficiency through collaboration, etc. There is a lot of insecurity in the sector, staff are worried about their jobs, so there needs to be clarity about their roles and responsibilities and what they are paid to do. Both within and between organisations there are different perceptions of “open”. For example, quality and assessment bodies have increased external openness by sharing assessment criteria, however due to confidentiality agreements institutions have to limit the data that is available to the public. There is still a tendency to release OER under restrictive open licences, limiting the ability to re-use, revise, re-mix, re-distribute the new resource. One way to overcome the “closed mind” mentality is to develop policy to support openness, however open doesn’t equal free or without cost, investment is required to make resources open. Openness is not always recognised, there are pockets of open activity throughout Scotland but these are not joined up. E.g. there are good examples of long-standing open practise among public libraries. Lack of quality assurance is still raised as a barrier to OER. Cable Green suggested there needs to be a shift in attitude and culture from “not invented here to proudly borrowed from there”. Under Creative Commons licence, resource creators can invoke a non-endorsement clause in situations where an original work is re-purposed but the originating authors does not approve of the repurposed work. Learners are co-creators of knowledge. How do we engage them? Learners, rather than institutions need to be central to all discussions relating to open policy and practice. What can Scotland learn from other countries? The UKOER programme evidenced interest in OER and willingness to change practice south of the border. How can Scotland learn from this and use this experience to springboard ahead? There are parallels between Scotland, the Nordic Countries and the devolved nations, is there scope for working collaboratively with other countries? How can open education policies and practices address the “Big Ticket” government agendas? Post 16 educations, widening access, knowledge transfer, driving changes in curriculum models, school – college – university articulation. The education sector is undergoing a period of massive change and it is difficult to cope with additional new initiatives and agendas. However the sector can also capitalise on this period of change, as change provides opportunity for radical new developments. At the school level the curriculum for excellence is changing the way children think and learn and universities and colleagues need to be ready for this. How can openness help? Funding has been cut drastically in the FE sector. Does this mean that fewer students will be taught or that colleges need to be smarter and make greater use of open educational resources? Articulation could be key to promoting the use of OER in Scotland. 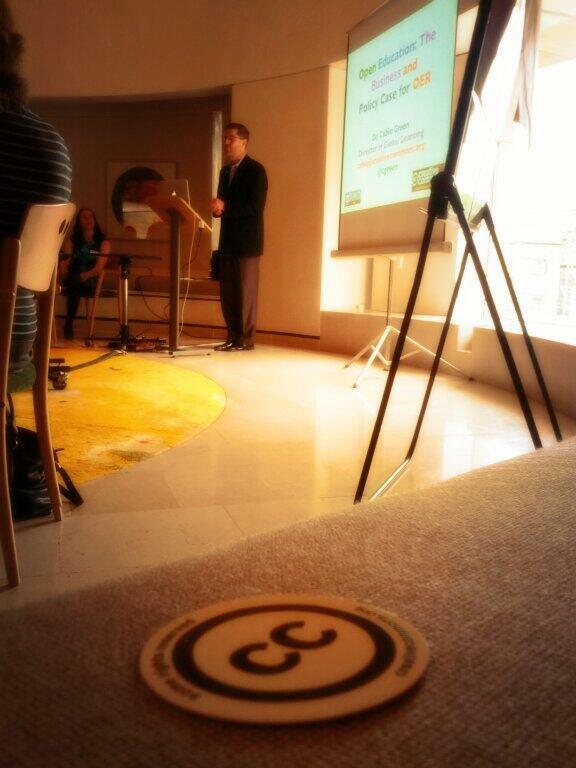 Many HEIs have produced resources for FE – HE articulation that could be released under Creative Commons licences. Using the UNESCO Paris Declaration as a starting point, the groups explored the potential of developing a Scottish open education declaration. There was general agreement that the Paris Declaration was a “good thing” however many participants felt it was too focused on OER and that a Scottish declaration should encompass open education more widely. In addition, the Paris Declaration focuses on “states”, a Scottish declaration would need to define its own stakeholders. It would also be beneficial to develop a common vocabulary (e.g. OER, open education, open learning, etc.) to enable effective communication and identify actions that move us forward. While there was agreement that the statements of the Paris Declaration were beneficial, it was felt that a degree of contextualisation was required in order to demonstrate these statements and principals in action. One group suggested that it might be useful to have a grid of the Declaration’s statements that stakeholders could fill in to provide evidence of the statements in action. Cable Green added that projects are on going internationally to implement specific actions from the Declaration and suggested that Scotland might consider selecting one or more statements to take forward as actions. Action 1 – Establish a working group, similar to Wales and the Nordic countries, that can stimulate research in the area of open education and inform future Government white papers. Cetis, SQA, Jisc RSC Scotland and the ALT Scotland SIG to discuss taking this forward. Action 2 – Invite participants from those nations that are further ahead of Scotland in promoting the open Agenda. Work with the other devolved nations in the UK. Action 3 – Use the working group to focus on key Government priorities and agendas, e.g. learner journeys, articulation, work based learning, knowledge transfer. Key Deliverable 2: A Scottish Open Learning declaration (including topologies, grids and action focussed statements). Key Deliverable 3: Government policy on open education. This will require stakeholder groups to state how they will engage with and contribute to the implementation of the policy. All these points are open to discussion and we would encourage all interested parties to contribute to the debate. Please feel free to comment here, or to contact the event organisers directly at the addresses below. If you blog or tweet about Open Scotland, or any of the issues raised as a result, please use the hashtag #openscot so we can track the discussion online. Phil Barker, phil.barker@hw.ac.uk; Lorna M. Campbell, lorna.m.campbell@ilcoud.com; Linda Creanor, l.creanor@gcu.ac.uk; Sheila MacNeill, sheila.macneill@me.com, Celeste McLaughlin, Celeste.McLaughlin@glasgow.ac.uk, Joe Wilson, joe.wilson@sqa.org.uk. Cetis would like to thank the following people for making the Open Scotland Summit possible: Phil Barker, Andrew Comrie, Linda Creanor, Martin Hawksey, Cable Green, Sheila MacNeill, Celeste Mclaughlin, Joe Wilson. Thanks also to our presenters Cable Green, Tore Hoel, David Kernohan, Wilbert Kraan, Sheila MacNeill, Paul Richardson, Scot Wilson. Arran Moffat and GloCast recorded and edited the presentations and valiantly attempted to stream Cable’s keynote through three foot thick tower walls! Now is the right time to push the open agenda forward. Scotland hasn’t missed the boat, sometimes it’s good to wait for the second wave. 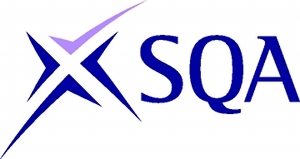 The ALT Scotland SIG, which both Martin Hawksey and I are involved in, is holding a meeting this week on Thursday the 20th at Glasgow Caledonian University from 10.30 – 15.30. Registration for the event is now closed, however there are still a few places available so if you would like to come along please drop Linda Creanor a mail at l.creanor@gcu.ac.uk. What do FutureLearn’s Terms and Conditions say about open content? ETA If you want to review yesterday’s twitter discussion about FutureLearn’s Terms and Conditions, Martin Hawksey has now set up one of his fabulous TAGSExplorer twitter archives here. All FutureLearn’s content and Online Courses, are the property of FutureLearn and/or its affiliates or its or their licensors and are protected by copyright, patent and/or other proprietary intellectual property rights under the laws of England and other countries. – Fair enough, I guess. Users may not copy, sell, display, reproduce, publish, modify, create derivative works from, transfer, distribute or otherwise commercially exploit in any manner the FutureLearn Site, Online Courses, or any Content. 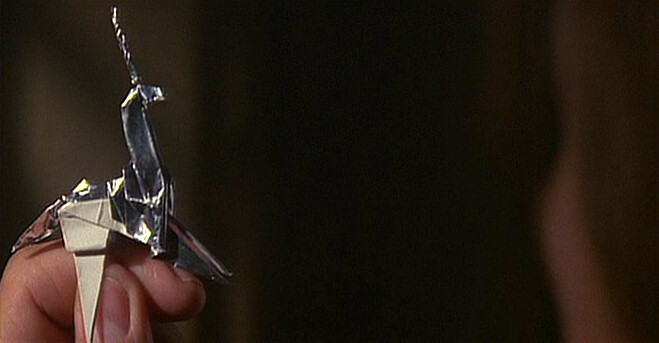 – If content can not be reproduced, modified or transferred then clearly it can not be reused, therefore it is not open. Future Learn grants users access to their content under the term of the Creative Commons Attribution – No Derivatices – Non Commerical 3.0 licence. – Again, use of the most restrictive Creative Commons licence means that FutureLearn content cannot be modified and reused in other contexts, therefore it is not open in any meaningful sense of the word. 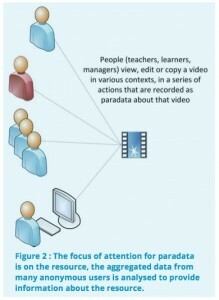 - Unless that content happens to be subtitles, captions or translations of FutureLearn content…. So there you have it, FutureLearn content will not be open educational resources in any real sense. I can’t say I’m surprised by FutureLearn’s Terms and Conditions and the approach they have taken to licensing educational content, but I am more than a little disappointed. Many colleagues have commented previously that the relationship between MOOCs and OERs is problematic, now it seems to have hit the skids altogether. I suppose I have to acknowledge that FutureLearn press releases have never said anything about the actual content of their courses being open, but I did hope rather naively that as the Open University have been at the forefront of OER initiatives in the UK, FutureLearn would buck the trend and take a similarly enlightened approach to their content. For the record, the Open University licenses their OpenLearn content under the more permissive Creative Commons ‘Attribution-Non-Commercial-Share-Alike’ licence. You can see the OpenLearn Intellectual Property FAQ here. As time passes, I can’t help thinking that the approaches to content licensing taken by the UKOER Programmes are starting to look increasingly radical… Anyone remember those heady days when universities were releasing their educational content under CC BY licence? Was it all just a dream? Along with the news that GCU and the Scottish College Development Network are developing guidelines for the creation and use of open educational resources, another Scottish news item caught my attention this week. Finally, after weeks of speculation, it was announced that the Universities of Glasgow and Strathclyde will join the FutureLearn partnership alongside the University of St Andrews which had previously signed up. You can read the press release here. FutureLearn doesn’t appear to make any mention of using, creating or disseminating open educational resources. Although it’s rather disappointing, I can’t say that it’s particularly surprising. I haven’t got any statistics, but anecdotally, it seems that very few xMOOCs use or provide access to open educational resources. The relationship between MOOCs and OERs is problematic at best and non existent at worst. As Amber Thomas memorably commented at the Cetis13 conference “it’s like MOOCs stole OER’s girlfriend.” Perhaps I am being overly pesimistic about FutureLearn’s commitment to openness, after all, the initiative is being led by the Open University, an institution that has unquestionably been at the forefront of OER developments in the UK. Of course St Andrews, Glasgow and Strathclyde aren’t the first Scottish universities to join the MOOC movement, the University of Edinburgh has already delivered six successful MOOCs in partnership with Coursera, including the eLearning and Digital Culture MOOC (#edcmooc) which my Cetis colleague Sheila MacNeill participated in and has blogged about extensively. Sheila recently presented about her experiences of being a MOOC student a the University of Southampton’s Digital Literacies Conference alongside #edcmooc tutor, and former CAPLE colleague, Dr Christine Sinclair, now with the University of Edinburgh. 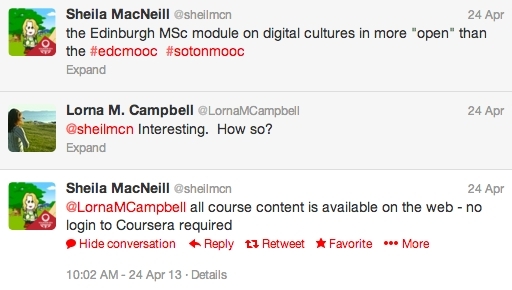 I wasn’t able to attend the event myself but I followed the tweet stream and was interested to note Sheila’s comments that the Edinburgh MSc module on digital cultures in more “open” than the Coursera MOOC on the same topic. It didn’t take much googling to locate the eLearning and Digital Cultures MSc course blog which, sure enough, carries a CC-BY-NC-SA licence. I don’t know if this licence covers all the course materials but it certainly appears to be more open than the Coursera version of the same course and it’s very encouraging to see that the Edinburgh course tutors are continuing to support open access to their course materials at the same time as engaging with MOOCs. I wonder if the Scottish FutureLearn partners will show a similar commitment to opening access to their educational resources? I certainly hope so. 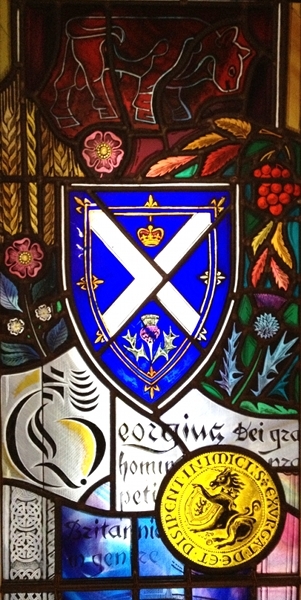 I was very encouraged by a couple of posts to the oer-discuss mailing list this week highlighting two Scottish institutions that are in the process of in developing guidelines and policies for the creation and use of open educational resources. The first post came from Marion Kelt, Senior Librarian at Glasgow Caledonian University, who shared the first draft of GCU’s Library Guidance on Open Educational Resources, which is based on guidelines developed and implemented by the University of Leeds. GCU Library encourages all staff and student to create and publish OERs and the guidelines strongly suggest that the use and creation of OERs should be the default position of all schools, departments and services. The guidelines recommend that OERs should be licensed using the Creative Commons Attribution licence (CC-BY) and make it clear that it is the responsibility of individual staff and students to ensure they have the rights to publish their resources. GCU should be identified as the licensor and copyright holder and staff are encouraged to assert their moral rights to be properly acknowledged as the author of the resources. The guideliens also recommend that GCU resources should be deposited in Jorum, and that audio or video based OER teaching resources should be deposited in the university’s multimedia repository, GCUStore. Re:Source is a Jorum-powered window onto the Scottish FE community’s open content which launched in November 2012. The service uses the existing Jorum digital infrastructure, together with customised branding and interface, to providing access to a rich collection of content from Scotland’s Colleges. It’s hugely encouraging to see Scottish universities and colleges taking steps to formulate coherent institutional OER guidelines and it’s even more encouraging that these guidelines acknowledge the beneficial role that institutional libraries and the Jorum national repository can play in supporting the creation, use and dissemination of open educational resources within institutions and across the sector. In light of the forthcoming Open Scotland event that Cetis are running togther with SQA, Jisc RSC Scotland and ALT Scotland SIG, I’d be very interested to hear if any other Scottish colleges or universities are in the process of developing similar guidelines or policies for the creation or use of open educational resources, or the adoption of open educational practices more widely, so if anyone knows of any more examples I’d be very grateful if you could let me know. summit focused on open education policy for Scotland which will take place at the National Museum of Scotland at the end of June. The event, which will bring together senior managers, policy makers and key thinkers, will provide an opportunity for critical reflection on the national and global impact of open education. Open Scotland will also provide a forum for identifying shared strategic priorities and scoping further collaborative activities to work towards more integrated policies and practice and encourage greater openness in Scottish education. ETA Many thanks to David Beards of SFC for pointing out that although this strategy is available from the SFC website, it is not an SFC publication. It was produced by the Sector Oversight Board; members of which are nominated by Universities Scotland and Colleges Scotland. The Scottish Sector Oversight Board has recently published a new Further and Higher Education ICT Strategy in response to the McClelland Review of ICT Infrastructure in the Public Sector in Scotland. This post summarises the main points of the SFC ICT strategy and briefly reflects on the the focus of the strategy and the potential role of open source and open standards to enable the delivery of its objectives. Infrastructure: networks, data centres, shared physical facilities. Governance and management: oversight boards, implementation groups, project management, procurement and partnership and relationship building, staff development, service level agreements, communication strategies. Shared services, applications and service models. New technologies and innovation: the future landscape for infrastructure, applications and services. Benchmark and baseline sectoral performance. Using international comparisons where relevant, and drawing on expert input from Jisc and UCISA. Identify KPIs, leading practice and “best of breed” approaches. Agree an evidence-based set of sectoral targets. Review and revise the roadmap set out by HEIDS Shared IT Services Study report. Shared datacentre provision has already been identified as a particular priority. Review the ‘data landscape’, in the sector, with a view to rationalisation / better management of student and course data. Work with merging colleges to implement consolidated MIS systems, with a longer-term aim of scoping a more efficient national student data system and moving to a single data collection system for generating reports for SFC. Develop the sector’s capability to develop and adopt shared services, including developing and capitalising on staff expertise. Form a new shared services cost-sharing body, owned by Scotland’s colleges and universities, within an existing organisation, with which institutions can contract for shared services. Continue to work with representative bodies of IT professionals in the HE and FE sectors. Improve value for money from procurement and operation of network infrastructure. Contribute to the JANET6 backbone procurement and participate in the Scottish Wide Area Network (SWAN) project to achieve better value for money through wider sharing of regional network infrastructure. Once the sectoral baseline has been established, service improvement will be measured from the following perspectives: financial, customers, business processes, learning and growth. An “engagement framework” will be developed to ensure all stakeholders feel ownership of the process of change. The strategy also proposes the development of a national website that will act as a single point of entry for the delivery of Scottish public services including, where appropriate, further and higher education services with links to relevant national bodies including UCAS, SQA and institutional websites. Jisc will continue to deliver large parts of the McClelland agenda, including collaborative procurement, national services like authentication & security and the promotion of common standards. Jisc helps foster best practice and efficiency in the use of innovative technology. Its carefully targeted research projects and reports make existing systems work better and help Scottish and UK institutions plan for the future. 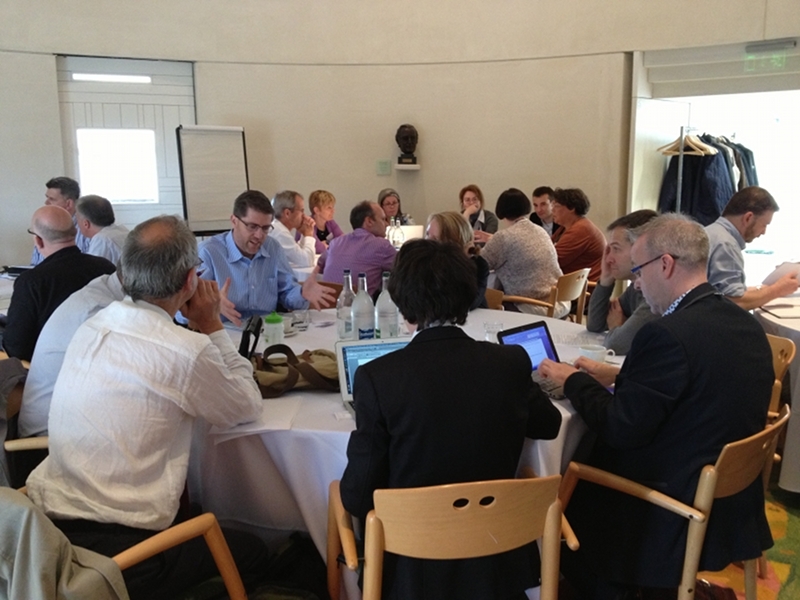 Jisc adds further value by encouraging and enabling a culture of sharing. It’s encouraging to note that one of the key principals of the McClelland Review, which is highlighted by the strategy, is “the adoption of agreed technical standards, protocols and security arrangements where these clearly add value.” And it’s even more encouraging to see SFC acknowledging that Jisc will be a key organisation with a role in delivering the McClelland agenda. However despite the fact that the strategy is clearly focused on cross sector collaborative development, facilitating greater integration of shared services and encouraging the adoption of institutional strategies to avoid technology lock in, the importance of open standards to enable the delivery of these objectives is not made explicit. Furthermore there is no reference to the key role that open source solutions can play in delivering efficiency gains and furthering sustainable collaborative development across the public sector.